No British Christmas is complete without a Christmas pudding. Despite reports that the traditional Christmas pudding has fallen out of favor​ for lighter desserts, it is as popular as ever. 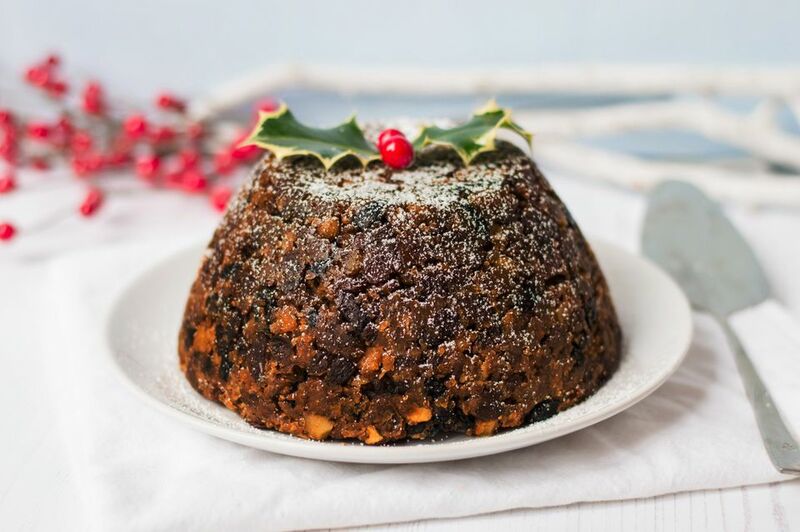 Christmas pudding is best made well in advance to allow it to mature which traditionally is made on ​"Stir it up Sunday", the Sunday before Advent around the end of November. Don't be put off by the number of ingredients in this recipe, although it may seem daunting, just assemble all your ingredients in advance, and the rest is easy. All that is left then is to make a wish. Lightly butter a 2 1/2 pint pudding basin. Place the dried fruits, candied peel, apple, orange, and lemon juice into a large mixing bowl. Add the brandy and stir well. Cover the bowl with a clean tea towel and leave to marinate for a couple of hours, preferably overnight. Stir the flour, mixed spice, and cinnamon together in a very large mixing bowl. Add the suet, sugar, lemon and orange zest, breadcrumbs, nuts and stir again until all the ingredients are well mixed. Add the marinated dried fruits and stir again. Beat the eggs lightly in a small bowl then stir quickly into the dry ingredients. The mixture should have a fairly soft consistency. Now is the time to gather the family for Christmas pudding tradition of taking turns in stirring, making a wish and adding a few coins. Spoon the mixture into the greased pudding basin, gently pressing the mixture down with the back of a spoon. Cover with a double layer of greaseproof paper or baking parchment, then a layer of aluminum foil and tie securely with string wrapping the string around the basin, then loop over the top and then around the bowl again. This will form a handle which will be useful when removing the pudding from the steamer. Place the pudding in a steamer set over a saucepan of simmering water and steam the pudding for 7 hours. Make sure you check the water level frequently, so it never boils dry. The pudding should be a dark brown color when cooked. The pudding is not a light cake but instead is a dark, sticky and dense sponge. Remove the pudding from the steamer, cool completely. Remove the paper, prick the pudding with a skewer and pour in a little extra brandy. Cover with fresh greaseproof paper and re-tie with string. Store in a cool, dry place until Christmas day. The pudding cannot be eaten immediately; it does need to be stored and rested, then reheated on Christmas day. Eating the pudding immediately after cooking will cause it to collapse, and the flavors will not have had time to mature. On Christmas day, reheat the pudding by steaming again for about an hour. Serve with brandy or rum sauce, brandy butter, or custard. Leftover Christmas pudding can be reheated by wrapping tightly in aluminum foil and heating through in a hot oven.